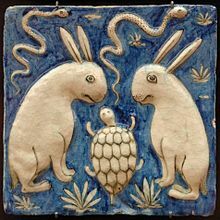 Tile with two rabbits, two snakes and a tortoise. Illustration for Zakariya al-Qazwini’s book, Marvels of Things Created and Miraculous Aspects of Things Existing (13th century). Earthenware, molded and underglaze-painted decoration. Iran, 19th century. Born in Qazvin, Iran, Zakariya Qazvini served as a legal expert and judge in several localities in Iran and at the city of Baghdad. He travelled around in Mesopotamia and the Levant, and finally entered the circle patronized by the governor of Baghdad, Ata-Malik Juvayni (d. 1283 CE). 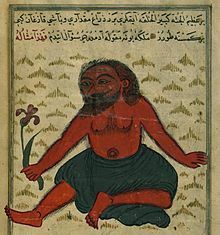 It was to the latter that Qazvini dedicated his famous cosmography titled “The Wonders of Creation” (عجائب المخلوقات وغرائب الموجودات, Marvels of Creatures and Strange Things Existing). This treatise, frequently illustrated, was immensely popular and is preserved today in many copies. It was translated into his native Persian language, and later also into Turkish. Qazvini was also well known for his geographical dictionary “Monument of Places and History of God’s Bondsmen” (آثار البلاد وأخبار العباد). Both of these treatises reflect extensive reading and learning in a wide range of disciplines.